Farewell to my Fishies | Nicole, Deipnosophist. This was supposed to be the post where I talk about my brand new planted aquarium. I’ve been dreaming of this aquarium for years, spent months in planning the plants/substrate/fish, and have spent the last couple of weeks on actually making my dream a reality. Saturday, I moved my four female bettas from the bare glass, 15-gallon, filterless tank to a beautiful 33-gallon tank full of plants and of baby snails for them to eat. I was extra careful to test the water parameters so the fish wouldn’t be stressed by the move. They settled into their new digs in about five minutes and started begging for food! I’ve had the pequeni?as (a play on a word from Speaker for the Dead) for two years. We’ve enjoyed watching them and their little hungry personalities, always crowding the upper corner of the tank because that’s where food can be found. They begged for food more than dogs!! Female bettas are overlooked as a pet in favor of the longer finned, sometimes more brightly colored, male bettas. But females can be kept in a group if suitably acclimated and they do not display as much aggression to other community fish. On the flip side, they are less bullied because they do not have the long, flowing fins to be nipped. By Sunday night, three of the females were ripe with eggs and two had on breeding stripes. This indicates that they were adapting extremely well to their new home. After work on Monday, I came home to pack a dinner and let the dog go outside. Standing next to the aquarium, I could feel it radiating heat. With sickness, I felt the glass. It was hot to the touch. The water was over 110 degrees F. The heater had failed in the “on” position and was cooking the tank’s inhabitants. Panicked, I looked in the aquarium. All four ni?as were long dead, suffocated by the heat. The plant leaves had already started to melt. I spent the evening doing water changes with cold water and ice, finally pulling the temperature back to 76 F. I couldn’t stop crying about my poor fish and the horrid way they died. I wrapped them in a pink satin ribbon and disposed of their little bodies (flushing them is a very irresponsible thing to do with a fish; it can spread disease in local water systems). I’m sure I will stop feeling sad sometime soon, but it’s hard to imagine for now. 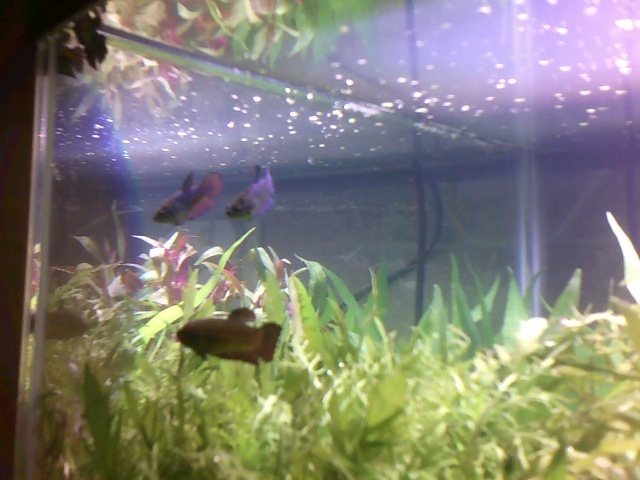 Luckily I snapped a couple of pictures of the fish in their new home just a day before they died. I’m also lucky that this happened in a tank with four fish- not 20, like I have planned for that tank. This entry was posted in Aquatic, Life in General by knharter. Bookmark the permalink.